Want a node list in sidebar as widget then this addon is for you. 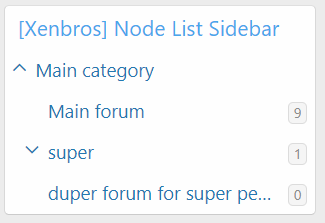 Node List Sidebar widget help to get the node tree as a menu form. It’s show the forum to 2 depth With this function, users could easily come to the forum/sub forum they want easily just by a click. – Admin can choose node for display on node list menu. – Fully support responsive layout.